Home » Bust of beardless Satyr. Greek sculpture. 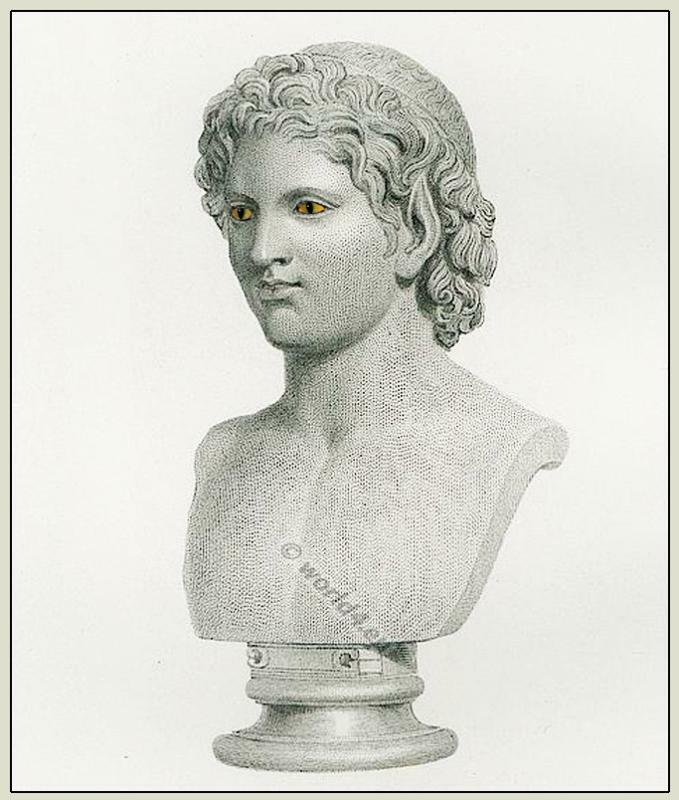 Bust of a young and beardless satyr, distinguished, as usual, by the pointed ears of a goat, and by hair in front shaggy and rough, like that of the same animal. At the top and back of the head the hair is of finer quality, with almost feminine curls. It may be remarked that the face is more rounded than usual, and that the physiognomy is, agreeably to the character of the youthful satyrs, expressive of mental indolence, with a slight dash of petulance, not amounting to rudeness. Of the many representations of satyrs in the museums of continental Europe, perhaps a head in the Glyptothek at Munich (1) comes the nearest to the one before us. This bust, which was bequeathed by the late R. Payne Knight, Esq., has been much restored, the nose, both the lips, and the breast being modern. It is of Parian marble, and in height without the pedestal, 12 1/2 inches. (1) Glyptothek at Munich, No. 107. Clarac, PL 728, No. 1745. This entry was posted in Ancient, Ancient Greece, Hairstyle and tagged Ancient sculpture on 8/15/13 by world4.